In this fifth week of seeing how God is Able, we will meet our fourth sister in this Sisters Stories series. As always, we lead with a chapter from Priscilla Shirer’s book, God is Able, which studies Ephesians 3:20 – Now to Him who is able to do exceeding abundantly beyond all that we ask or think, according to the power that works within us, to Him be the glory in the church and in Christ Jesus to all generations forever and ever. This portion of the verse, “all that we can ask or think,” is so appropriate for this transformative sister story. Understood He Is Able To Do. And studied Exceedingly Abundantly Beyond. Priscilla investigated the original language of that word, “all,” and discovered that it meant ALL. As in TOTALITY. His activity is not confined to the spectacular…sometimes our problem is not that we won’t believe Him for the supernatural but that we don’t believe He cares about the routine. Limiting our view of God’s interest and activity to the stupendous is not really much different from limiting our view of God to the boring….His ability comes all the way down to the ground. Where you are. Every day….The same God who made elephants and buffaloes also made pansies and ladybugs. Big and small. He cares about them all. The verse doesn’t stop at all though. No. It goes further. God works beyond all you can ask or think. Or in my favorite translation, all you could ask or imagine. I’m pretty imaginative. But God. My God. Well He’s not constrained by my imagination. He is not limited by whether we know the right words to ask or have a handle on the future enough to know what we should ask. The things we don’t know how to pray, as well as the things we don’t even know to be praying for at all, are still under His control. 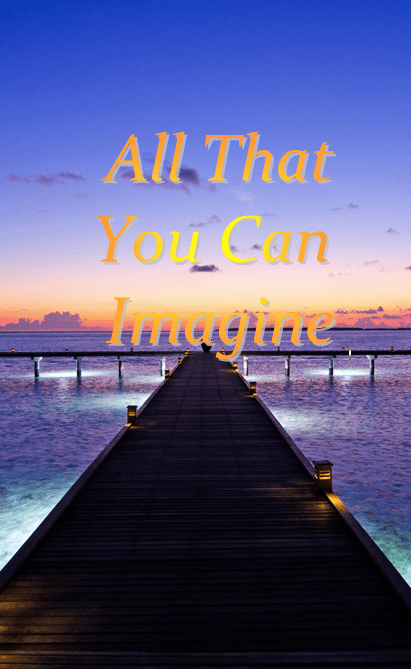 He can do all that we can “ask or think.” More than we can imagine. Did you hear that? The vast extent to which your mind could draw together what, in your estimation, would be the most exquisite plan for the solution you need doesn’t even begin to touch the hem of His ability. He does beyond it. Beyond all your words. Beyond all your thoughts. This week I have the honor of introducing you to Rebecca. A dear longtime friend of mine. When devastation shook her life, this verse took on a whole new meaning. She could never have imagined what lay ahead, yet our big God promised to act on her behalf even when she couldn’t see a way forward. When she couldn’t have known how He would restore what the locusts had eaten (Joel 2:25). Join me Wednesday as you hear how God sees ALL and acts beyond what we could have imagined.